A β-blocker, metoprolol, is one of the in vivo probes for human cytochrome P450 (P450) 2D6. Investigation of nonhuman primate P450 enzymes helps to improve the accuracy of the extrapolation of pharmacokinetic data from animals into humans. Common marmosets (Callithrix jacchus) are a potential primate model for preclinical research, but the detailed roles of marmoset P450 enzymes in metoprolol oxidation remain unknown. In this study, regio- and stereo-selectivity of metoprolol oxidations by a variety of P450 enzymes in marmoset and human livers were investigated in vitro. Although liver microsomes from cynomolgus monkeys and rats preferentially mediated S-metoprolol O-demethylation and R-metoprolol α-hydroxylation, respectively, those from humans, marmosets, minipigs, and dogs preferentially mediated R-metoprolol O-demethylation, in contrast to the slow rates of R- and S-metoprolol oxidation in mouse liver microsomes. R- and S-metoprolol O-demethylation activities in marmoset livers were strongly inhibited by quinidine and ketoconazole, and were significantly correlated with bufuralol 1′-hydroxylation and midazolam 1′-hydroxylation activities and also with P450 2D and 3A4 contents, which is different from the case in human livers that did not have any correlations with P450 3A–mediated midazolam 1′-hydroxylation. Recombinant human P450 2D6 enzyme and marmoset P450 2D6/3A4 enzymes effectively catalyzed R-metoprolol O-demethylation, comparable to the activities of human and marmoset liver microsomes, respectively. These results indicated that the major roles of P450 2D enzymes for the regio- and stereo-selectivity of metoprolol oxidation were similar between human and marmoset livers, but the minor roles of P450 3A enzymes were unique to marmosets. Species similarities and differences for metabolic clearance of drug candidates are important issues for drug development. For predicting human toxicokinetic and pharmacokinetic profiles of drug candidates, nonhuman primates have been used because of their physiologic and genetic similarity to those of humans (Orsi et al., 2011; Sasaki, 2015). Common marmosets (Callithrix jacchus), small New World Monkeys, are useful nonhuman primate species for preclinical testing due to the functional similarity of cytochrome P450 (P450) enzymes with those of humans (Uno et al., 2016). Recently, our studies demonstrated similar enzymatic properties of P450 3A and 2D enzymes (Uehara et al., 2015a; 2017b). Metoprolol is a β-adrenergic blocking drug that is used in cardiovascular medicine. Racemic mixtures of metoprolol have been used for treating hypertension, angina pectoris, and arrhythmia, but the pharmacological effects reside in the S-enantiomer of metoprolol (Lennard et al., 1986). Metoprolol is metabolized through O-demethylation (65% of dose), α-hydroxylation (10% of dose), and N-dealkylation (10% of dose) in humans in vivo (Borg et al., 1975). The α-hydroxylation of metoprolol is catalyzed almost entirely, and O-demethylation of metoprolol is catalyzed partially through human P450 2D6 (Otton et al., 1988). Reportedly, human P450 2D6 preferentially catalyzed the R-enantiomer faster than the S-enantiomer (Mautz et al., 1995). In our recent studies, marmoset P450 2D6 and 2D8 enzymes catalyzed metoprolol O-demethylation (Uehara et al., 2015a), indicating that the roles of marmoset P450 enzymes in metoprolol metabolism need to be further elucidated for preclinical studies. In this study, the role of P450s for regio- and stereo-selective metoprolol oxidation was evaluated in marmosets and humans. We report herein the high affinity of marmoset P450 2D enzymes with R-metoprolol O-demethylation and the high capacity of marmoset P450 3A enzymes for R- and S-metoprolol O-demethylation. Detailed methods are shown separately in the Supplemental Material. Pooled liver microsomes from mice (CD-1, 8 males, 11 weeks of age), rats (Sprague-Dawley, 3 males), minipigs (Gottingen, 2 males, 7 months of age), dogs (10 males, >12 months of age), marmosets (5 males, sexually mature), and humans (74 males and 76 females, 18–82 years of age) were purchased from Corning Life Sciences (Woburn, MA). Pooled liver microsomes from cynomolgus monkeys (5 males, sexually mature) were purchased from Xenotech (Lenexa, KS). Liver microsomes from 17 individual human subjects were obtained from Corning Life Sciences. Individual liver microsomes were prepared from 23 marmosets (14 males and 9 females, >2 years of age) at the Central Institution for Experimental Animals (Kawasaki, Japan) in our laboratory, as described previously (Uehara et al., 2017a). This study was reviewed and approved by the Institutional Animal Care and Use Committee (Central Institution for Experimental Animals). Activities of metoprolol O-demethylation and α-hydroxylation by liver microsomes and recombinant P450s were measured as described previously (Uehara et al., 2015a) with some minor modifications. A Pearson product-moment correlation was performed with GraphPad Prism (GraphPad, La Jolla, CA). Values of kinetic parameters Vmax, Michaelis constant (Km), and Vmax/Km were determined by fitting to an integrated form of the Michaelis-Menten equation using Kaleidagraph (Synergy Software, Reading, PA). R- and S-metoprolol oxidation activities by liver microsomes from humans, cynomolgus monkeys, marmosets, minipigs, dogs, rats, and mice were determined at a substrate concentration of 1.0 μM (Fig. 1). Rat liver microsomes preferentially catalyzed R- and S-metoprolol α-hydroxylation rather than O-demethylation, in contrast to the slow rates of R- and S-metoprolol oxidation in mouse liver microsomes. On the other hand, cynomolgus monkey liver microsomes effectively catalyzed R- and S-metoprolol O-demethylation rather than α-hydroxylation. 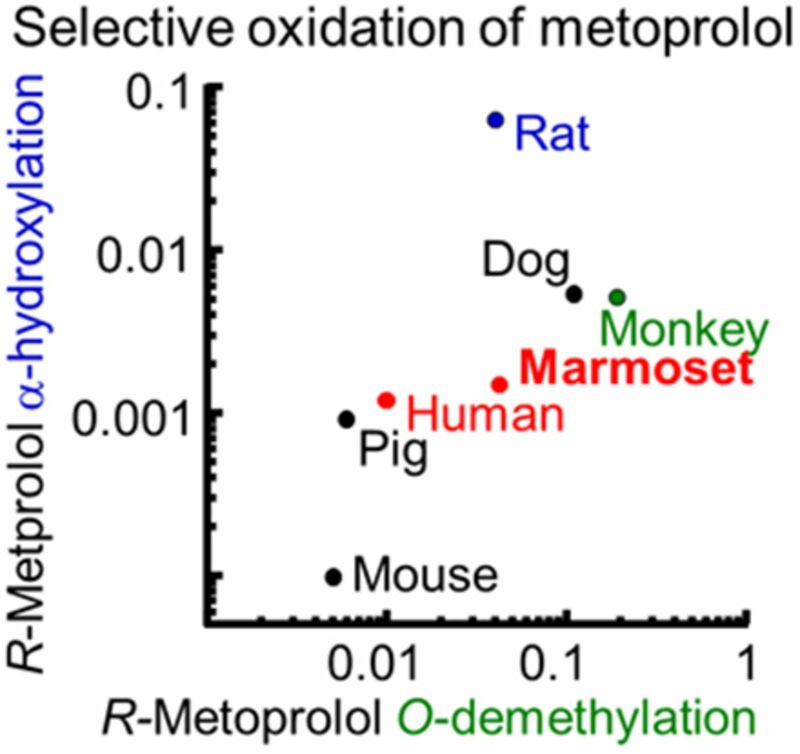 Human, marmoset, and minipig liver microsomes showed roughly similar regio- and stereo-selective R- and S-metoprolol oxidation activities under the present conditions. R- and S-metoprolol oxidation activities by liver microsomes from humans, cynomolgus monkeys, marmosets, minipigs, dogs, rats, and mice. R- (A) and S- (B) metoprolol (1.0 μM) were incubated with pooled liver microsomes (0.20 mg/ml) at 37°C for 15 minutes in the presence of an NADPH-generating system in triplicate determinations. R- and S- metoprolol oxidation activities by human and marmoset recombinant P450 enzymes were determined at the substrate concentration of 10 μM (Supplemental Fig. 1). High catalytic activities of R-metoprolol O-demethylation by human and marmoset recombinant P450 2D6 enzymes were observed. Rates of R- and S-metoprolol O-demethylation by marmoset P450 3A4 and 3A90 enzymes were higher than those of human P450 3A4 and 3A5 enzymes. Human and marmoset P450 2D6 enzymes also catalyzed R- and S- metoprolol α-hydroxylation at slow rates. The roles of P450 enzymes in metoprolol O-demethylation by liver microsomes from humans and marmosets were investigated. Correlations between R- and S-metoprolol O-demethylation activities and P450 probe oxidation activities in individual human and marmoset liver microsomes were determined (Supplemental Fig. 2). R- and S-metoprolol O-demethylation activities in human liver microsomes at substrate concentrations of 1.0 and 100 μM were significantly correlated to those of bufuralol 1′-hydroxylation (r > 0.67). A high correlation coefficient (r = 0.91) was observed for R-metoprolol O-demethylation activities at the substrate concentration of 1.0 μM. R- and S-metoprolol O-demethylation activities in marmoset liver microsomes at substrate concentrations of 1.0, 10, and 100 μM were also significantly correlated with bufuralol 1′-hydroxylation (r > 0.77). High correlation coefficients (r > 0.83) were observed for R- and S-metoprolol O-demethylation activities at low substrate concentrations of 1.0 or 10 μM. R- and S-metoprolol O-demethylation activities in marmoset liver microsomes at substrate concentrations of 1.0, 10, and 100 μM were also significantly correlated to those of midazolam 1′-hydroxylation (r > 0.71), which is different from the case in human liver microsomes. In addition, R- and S-metoprolol O-demethylation activities in marmoset liver microsomes at the low substrate concentration of 1.0 μM were significantly correlated with P450 2D enzyme contents (r > 0.63) and P450 3A4 enzyme contents (r > 0.69) in marmoset liver microsomes (Supplemental Fig. 3). The effects of P450 inhibitors for R-metoprolol O-demethylation liver microsomes from humans and marmosets were determined at the substrate concentration of 10 μM (Supplemental Fig. 4). Dose-dependent suppression by quinidine (human P450 2D6 inhibitor, 2.0–20 μM) was observed for R-metoprolol O-demethylation in human liver microsomes (less than 23% of control activities) and for R- and S-metoprolol O-demethylation in marmoset liver microsomes (less than 10% of control activities). R- and S-metoprolol O-demethylation in marmoset liver microsomes was also dose-dependently suppressed by 1.0–10 μM ticlopidine (human P450 2C19 and 2D6 inhibitors; Ko et al., 2000) to ∼26% of control activities. R- and S-metoprolol O-demethylations in marmoset liver microsomes were suppressed to less than 24% in the presence of 100 μM ketoconazole (human P450 3A inhibitor), in contrast to results showing that ketoconazole (100 μM) inhibited R- and S-metoprolol O-demethylation in human liver microsomes to half of control activities (Supplemental Fig. 4). Taken together, liver microsomal marmoset P450 2D6 effectively mediated R- and S-metoprolol O-demethylation in a manner similar to that in human liver microsomal P450 2D6, but the roles of P450 3A enzymes for R- and S-metoprolol O-demethylation in liver microsomes were partially different between human and marmoset livers. Kinetic analyses for O-demethylation and α-hydroxylation of R- and S-metoprolol were performed using liver microsomes from humans and marmosets and recombinant P450 enzymes (Supplemental Fig. 5; Table 1). Liver microsomes from humans and marmosets showed low and high Km values (humans, 15 and 190 μM; marmosets, 14 and 120 μM) for R-metoprolol O-demethylation activities with similar Vmax values (humans, 0.15 and 0.48 nmol/min/mg protein; marmosets, 0.63 and 0.59 nmol/min/mg protein), respectively; those two component Km values for R-metoprolol O-demethylation were lower than the Km values (humans, 32 and 920 μM; marmosets, 21 and 150 μM) for S-metoprolol O-demethylation. Liver microsomes from humans and marmosets indicated low Km values (37 and 27 μM) for R-metoprolol α-hydroxylation with low Vmax values (0.054 and 0.047 nmol/min/mg protein) compared with those for S-metoprolol α-hydroxylation. Liver microsomes from humans and marmosets showed high Vmax/Km values (humans, 0.010 and 0.0025 ml/min/mg protein; marmosets, 0.045 and 0.0049 ml/min/mg protein) for R-metoprolol O-demethylation, in both the high- and low-affinity components. It has been suggested that the high affinity for R-metoprolol O-demethylation in human liver microsomes and for R- and S-metoprolol O-demethylation in marmoset liver microsomes is accounted for by P450 2D6 enzymes because the corresponding recombinant P450 2D6 enzymes had a Km value of 11 μM for R-metoprolol O-demethylation and Km values of 62 and 61 μM for R- and S-metoprolol O-demethylation, respectively. Recombinant human and marmoset P450 2D6 enzymes showed high Vmax/Km values (3.3 and 0.48 ml/min/nmol) for R-metoprolol O-demethylation compared with S-metoprolol O-demethylation. Marmoset P450 2D8 enzymes showed low Vmax/Km values (0.028 and 0.024 ml/min/nmol) for R- and S-metoprolol O-demethylation compared with marmoset P450 2D6 enzymes. Marmoset P450 3A4 showed high Km values (280 and 290 μM) and low Vmax values (0.43 and 0.46 ml/min/nmol P450) for R- and S-metoprolol O-demethylation. In contrast, Km values for R- and S-metoprolol O-demethylation in human P450 3A enzymes and other enzyme sources were high (over ∼500 μM) under the present conditions. Oral administration of metoprolol in cynomolgus monkeys and minipigs yielded plasma concentrations similar to their quantitative detection limits (Mogi et al., 2012; Shida, et al., 2015), suggesting rapid oxidative clearance of metoprolol in vivo in a manner similar to that of in vitro oxidation in cynomolgus monkeys (Fig. 1). At a high concentration of 100 µM (not at 1.0 µM, as in Fig. 1), metoprolol oxidation by minipig liver microsomal P450 2D25 enzymes was faster than that in human liver microsomal P450 2D6 enzymes (Mogi et al., 2012; Yamazaki, 2014), resulting in a low bioavailability of metoprolol after oral administration in minipigs. On the other hand, human plasma concentrations of P450 probes containing metoprolol reportedly can be extrapolated from the corresponding data in marmosets after oral administration using simplified physiologically based pharmacokinetic modeling with in vitro metabolic clearance data (Utoh et al., 2016). In this study, liver microsomes from humans and marmosets preferentially mediated R-metoprolol O-demethylation rather than S-metoprolol O-demethylation (Fig. 1), which is different from cynomolgus monkeys. Stereo-selectivity for R-metoprolol O-demethylation by marmoset liver microsomes was efficiently mediated by liver microsomal P450 2D6, as shown in this study (Supplemental Fig. 1; Table 1), which is similar to reported human P450 2D–dependent R-metoprolol O-demethylation (Mautz et al., 1995). The calculated Vmax/Km values for R- and S-metoprolol O-demethylation in liver microsomes from humans and marmosets were comparable (Table 1), which showed stereo-selective metoprolol O-demethylation in a manner similar to that in recombinant human and marmoset P450 2D6 enzymes (Supplemental Fig. 1). The stereo-selectivity for R-metoprolol O-demethylation by marmoset liver microsomal P450 2D enzymes was not as predominant as that of human liver microsomal P450 2D6 enzymes in the correlation analyses (Supplemental Figs. 2 and 3) and inhibition assays with quinidine (Supplemental Fig. 4). On the other hand, R- and S-metoprolol O-demethylation by marmoset liver microsomes was efficiently mediated by liver microsomal P450 3A enzymes significantly correlated to midazolam 1′-hydroxylation and was strongly suppressed by ketoconazole (different from the cases of human liver microsomes). It was suggested that the roles of liver microsomal P450 3A enzymes for R- and S-metoprolol O-demethylation were different between humans and marmosets. In terms of R- and S-metoprolol O-demethylation activities by marmoset liver microsomes, the metabolite formation rate per milligram of protein was high compared with those of human liver microsomes (Fig. 1), possibly accounted for by marmoset P450 2D and 3A enzymes, which contributed equally at low substrate concentrations, as is evident from the correlation analysis (Supplemental Figs. 2 and 3). In this study, metabolite formation from R- and S-metoprolol in vitro elucidated P450 2D–dependent enantioselective metabolism in marmoset livers (Table 1). Further study of plasma concentrations of metoprolol and the metabolites separately in marmosets in vivo would be of great interest. Similarly, regio- and stereo-selective oxidation of a classic β-blocker, propranolol, in human, cynomolgus monkey, and marmoset livers has been investigated (Narimatsu et al., 2011). Propranolol enantiomers were S-enantiomer stereo-selectively oxidized by human P450 2D6, cynomolgus monkey P450 2D6 (2D17), and marmoset P450 2D6 enzymes mainly into 4-hydroxypropranolol, followed by 5-hydroxypropranolol and N-desisopropylpropranolol, but cynomolgus monkey P450 2D6 (2D17) enzymes had stronger high N-desisopropylpropranolol formation activity among these three primate P450 2D enzymes. These results, together with the results in the present study, suggest similar regio- and stereo-selectivity of human and marmoset P450 2D6 enzymes. Metoprolol pharmacokinetics in humans has been influenced by human P450 2D6 genotype groups (Blake et al., 2013). There was a significant difference with nearly 40% lower R- than S-metoprolol concentrations in plasma between ultra-rapid and extensive metabolizers having two active P450 2D6 alleles and two P450 2D6-null alleles (Blake et al., 2013). Marmoset P450 enzymes show high sequence homology to their human counterparts (Uno et al., 2016), and genetic polymorphisms have recently been found in the marmoset P450 2C19 gene (Uehara et al., 2015b, 2016). However, we have not found marmoset P450 2D6 nonsynonymous variants even after screening the genomes of nearly 80 individual marmosets by direct sequence analysis (S. Uehara, unpublished data). If marmoset P450 2D6 variants might change the properties of enzymes like marmoset P450 2C19 (Uehara et al., 2015b, 2016), marmosets harboring genetic variants would be suitable models for enantioselective drug metabolism associated with the polymorphic P450 2D enzyme in livers. In conclusion, metoprolol oxidation activities were evaluated with respect to regio- and stereo-selective R- and S-metoprolol O-demethylation in humans and marmosets. The high affinities of human and marmoset P450 2D6 enzymes with respect to R-metoprolol O-demethylation and the capacities of marmoset liver microsomal P450 3A enzymes for R- and S-metoprolol O-demethylation were observed. The present results demonstrated that the major roles of marmoset liver microsomal P450 2D6 enzymes for the regio- and stereo-selective metoprolol oxidation were similar to those of human P450 2D6, but the minor roles of P450 3A enzymes were unique to marmosets. Therefore, marmosets may be a good model for P450 2D–dependent regio- and enantio-selective drug metabolism in preclinical studies. Participated in research design: Uehara, Uno, and Yamazaki. Conducted experiments: Uehara and Ishii. Contributed new reagents or analytic tools: Inoue and Sasaki. Performed data analysis: Uehara, Ishii, and Yamazaki. Wrote or contributed to the writing of the manuscript: Uehara, Uno, and Yamazaki. This work resulted from “Construction of System for Spread of Primate Model Animals” under the Strategic Research Program for Brain Sciences of the Japan Agency for Medical Research and Development. S.U. was also supported partly by a Japan Society for the Promotion of Science Grant-in-Aid for Young Scientists B [15K18934]. (2013) A meta-analysis of CYP2D6 metabolizer phenotype and metoprolol pharmacokinetics. Clin Pharmacol Ther 94:394–399. (1975) Metabolism of metoprolol-(3-h) in man, the dog and the rat. Acta Pharmacol Toxicol (Copenh) 36 (Suppl 5):125–135. (2000) In vitro inhibition of the cytochrome P450 (CYP450) system by the antiplatelet drug ticlopidine: potent effect on CYP2C19 and CYP2D6. Br J Clin Pharmacol 49:343–351. (1986) The polymorphic oxidation of beta-adrenoceptor antagonists. Clinical pharmacokinetic considerations. Clin Pharmacokinet 11:1–17. (1995) Regioselective and stereoselective oxidation of metoprolol and bufuralol catalyzed by microsomes containing cDNA-expressed human P4502D6. Drug Metab Dispos 23:513–517. (2012) Simultaneous pharmacokinetics assessment of caffeine, warfarin, omeprazole, metoprolol, and midazolam intravenously or orally administered to Microminipigs. J Toxicol Sci 37:1157–1164. (2011) Regio- and stereoselective oxidation of propranolol enantiomers by human CYP2D6, cynomolgus monkey CYP2D17 and marmoset CYP2D19. Chem Biol Interact 189:146–152. (2011) Overview of the marmoset as a model in nonclinical development of pharmaceutical products. Regul Toxicol Pharmacol 59:19–27. (1988) Use of quinidine inhibition to define the role of the sparteine/debrisoquine cytochrome P450 in metoprolol oxidation by human liver microsomes. J Pharmacol Exp Ther 247:242–247. (2015) Prospects for genetically modified non-human primate models, including the common marmoset. Neurosci Res 93:110–115. (2015) Human plasma concentrations of cytochrome P450 probes extrapolated from pharmacokinetics in cynomolgus monkeys using physiologically based pharmacokinetic modeling. Xenobiotica 45:881–886. (2015a) Marmoset cytochrome P450 2D8 in livers and small intestines metabolizes typical human P450 2D6 substrates, metoprolol, bufuralol and dextromethorphan. Xenobiotica 45:766–772. (2015b) Novel marmoset cytochrome P450 2C19 in livers efficiently metabolizes human P450 2C9 and 2C19 substrates, S-warfarin, tolbutamide, flurbiprofen, and omeprazole. Drug Metab Dispos 43:1408–1416. (2016) Oxidation of R- and S-omeprazole stereoselectively mediated by liver microsomal cytochrome P450 2C19 enzymes from cynomolgus monkeys and common marmosets. Biochem Pharmacol 120:56–62. (2017a) Marmoset cytochrome P450 4A11, a novel arachidonic acid and lauric acid ω-hydroxylase expressed in liver and kidney tissues. Xenobiotica 47:553–561. (2017b) Marmoset cytochrome P450 3A4 orthologue expressed in liver and small intestine tissues efficiently metabolizes midazolam, alprazolam, nifedipine, and testosterone. Drug Metab Dispos 45:457–467. (2016) Utility of non-human primates in drug development: comparison of non-human primate and human drug-metabolizing cytochrome P450 enzymes. Biochem Pharmacol 121:1–7. (2016) Human plasma concentrations of cytochrome P450 probe cocktails extrapolated from pharmacokinetics in mice transplanted with human hepatocytes and from pharmacokinetics in common marmosets using physiologically based pharmacokinetic modeling. Xenobiotica 46:1049–1055. (2014) Species, ethnic, and individual differences in human drug-metabolizing cytochrome P450 enzymes, in Fifty Years of Cytochrome P450 Research (Yamazaki H, ed) pp 293–305, Springer, Tokyo.